Hess is the Winner of a Hot Bout With the St Louis Boxer. 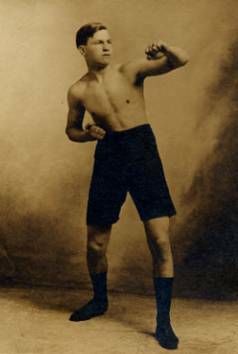 Buck Crouse, of Pittsburg, won by a shade from Frank Mantell, a Dayton pug. in a ten round bout at the Majestic last night. Crouse carried the fighting to Mantell at all limes and had to do all the aggressive work. Mantell set himself down on his heels and waited for Buck to come in. The latter worked persistently on the jaw and left ear of the Buckeye with a straight right from the shoulder, but failed to leave any impression on these members. Crouse jumped from his corner to the center of the ring at the opening gong and from that time to the close never let things lag as far as it was possible for him to keep them going. The veteran Mantell, towards the end of the bout, kept calling for him to "come on" and worked a few other stunts to show how far from all-in he was, but it is not likely that he made himself any more popular with the fans by his comedy. Mantell fought a defensive game and stood the gaff in fine style, but he didn’t live up to his rep of mixing things up and taking the initiative. There is no doubt he is well trained and an experienced boxer, but most of his evenings work last night consisted of blocking Crouse’s punches. The latter fought with his head in the air and watched every move, but the right from the shoulder was the ony blow which he could register. Sometimes the Pittsburg boy would get two or three of these in quick succession and would have Mantell snorting like a wild horse, but Frank always came up and never showed the wear. In the third round Mantell opened up and sent out a line of wallops that gave him the inning and had the fans pulling for him to keep it up. This didn’t last however and he sank back on his heels in the fourth and left the initiative to his younger opponent. George Biemer was sore about Mantell’s showing, and especially after the line he handed out in the afternoon proceeding the scrap, telling what he thought of scrappers who stall. His manager was instructed to tell Mantell to open up, if he knew how, and fight. Frank took the next round, then settled back once more to put in the time till the final gong. He almost got the finisher in the closing frame when Crouse landed a blow to the head which seemed to have some effect on that seemingly solid member of the fighter's make-up, going to the ropes Crouse did not follow this up quickly enough, however, and blew chances of a K. 0. Manager Biemer stated after the show that he has seen plenty of the middles and light-heavies and that it is impossible to set two of them together any more without having one of them spoil the show by stalling. In the future the lighter boys will appear here.